Together with Lina, Christian and Markus I participated in the St. Olaf project this year. 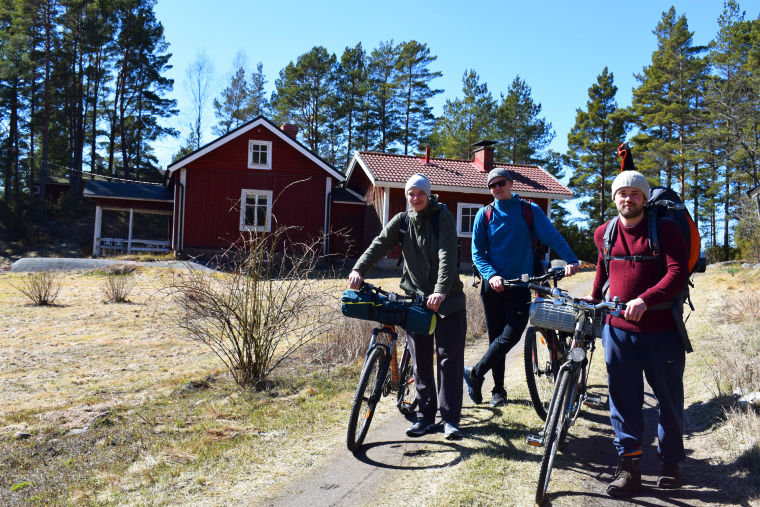 For us, it was clear from the very beginning that we would test the route from Åbo to Korpo by bike, not by foot. This due to the fact, that both Christian and Markus had walked the same route the year before, and wanted to spice it up a little. Lina and myself haven’t been a part of the project from the beginning, but thought it would be nice to challenge ourselves a bit, and a Tour de Archipelago sounded perfect. We knew we had a lot to plan and organise before we could head out, and we gave ourselves loads of time by picking a date a couple of months prior to our eventual departure. First, our gear was scattered all over southern Finland. A bicycle here, a tent and sleeping bags there, proper clothing somewhere else. I am glad we had enough time to gather everything. I should add, that we decided to set up camp in the middle of the forest instead of seeking shelter in a guest house. We all share a love for nature, so it wasn’t a hard decision at all. Second, it’s ALWAYS more to it than you could ever imagine; it usually is too optimistic to think that everything will go exactly according to plan. In other words, new details you must address will emerge as your planning progresses. You will realize you need this tool for the bike in case of… What if the weather isn’t what you hoped it would be? What do we need if we get blisters? A flat tyre? Careful planning will see to it, that you will get most of it sorted out. I said “most of it”, because sometimes life just gives you unexpected lemons. Take our journey as an example: Markus’ pedal broke after roughly 15 kilometres. We laughed about it because it was so tragicomic. He has had that bike for a couple of years now, ridden it almost every day. Never before has he had problems with it; it has run as smoothly as clockwork. But, obviously, when he least expected it, and at a time when he need it to work with him, it broke down. Fortunately for us we were only 8 kilometres from Pargas, our first snack break, so we managed to get him to a bicycle service without bigger problems. It was irritating of course, and it slowed us down, but it could’ve been much worse. Another thing that happened was rain. About a week before our departure it became clear to us that we had to prepare for heavy rainfall. According to the forecast, it was set to rain from five in the afternoon ‘til three the next morning. This was unfortunate, but it was not the end of the world. It simply meant we had to do some additional planning. Proper clothing, as well as extra dry clothing, became the key. We headed out early in the morning, hoping to arrive in Korpo before the rain. Due to some complications along the way we didn’t make it. It didn’t rain too much, but the tent got wet while we were setting it up. We had arranged an additional plastic sheet to cover the tent with, to keep most of the water out, which it did. What we didn’t consider was condensation. Although we managed to keep most of the rain outside, droplets of water started forming on the inside of our tent, which made everything we had stacked along the inner edges of the tent wet. Our phones, snacks, magazines, dry clothes, our hair and our sleeping bags. This was not too comfortable, but we learned our lesson; see to it, that you take bags of different sizes with you where you can put your clothes and valuables, and where they’ll be safe from water and humidity. Cold weather is not your enemy, water is. I would much rather sleep in a tent in 10 degrees below freezing than in much warmer, but wet, conditions. Lastly I would like to say a few words about what you could call “motivators”. In times of both physical and mental exhaustion, you learn to appreciate the littlest of things. In such moments of distress and despair, the so called motivators will come in handy. For some people, it might be a chocolate bar, for others a raspberry flavoured soda. Some may appreciate a cinnamon roll, or maybe something as simple as a cigarette. Whatever your guilty pleasure may be, it will play an important role in keeping your mood up and your self-pity at bay. Allow yourself a treat every now and then, and I’m sure you will overcome your discomfort, no question about it.